The classic double-slit experiment is a really good example of an amazing quantum phenomenon: interference of photons, and gets to the heart of the wave-particle duality that photons exhibit. Imagine a small light source in an otherwise dark room. On the other side of the room is a photographic plate. If we shoot a stream of photons at it, the plate will turn black. If we place a sheet of metal in between the two, the photographic plate will not turn black. Now, let’s cut two thin parallel slits in the sheet metal and run a few experiments. If we cover the right slit and turn on the light, after a while we will get a black band on the film where the light has passed though the left slit. Next, open the right slit and cover the left slit. That will give us another black band that partially overlaps the first one. Next, with a fresh photographic plate, open both slits. Surprisingly, you do not get the same pattern on the plate. Instead, you will get a zebra striped pattern—a series of dark and light bands. the light bands are areas of destructive interference, a well-know property of waves. This is where the light going through both slits cancel out. Let’s try doing the whole experiment again, but this time we will turn down the intensity of the light source so that only one photon comes through at a time, like a dripping faucet. When we cover one slit and expose the plate for a short while, we will see a few dark dots appear where the individual photons landed. If we let it run some more, we get more dots, and if we let it run long enough we will reproduce the results of the first experiment. The photons are arriving randomly, and only after enough of them accumulate do we see the original pattern. Finally, let’s run this new experiment with both slits open. Remember, only one photon is passing through either slit at a time. 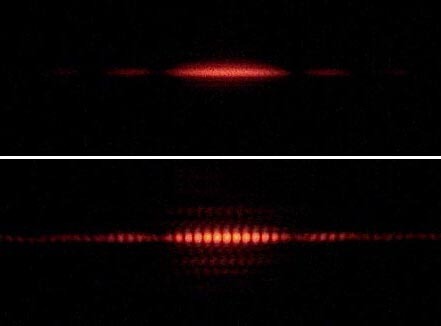 Yet in this experiment, the photon do not land where the destructive interference took place [The figure at right is the result of a double-slit experiment showing the build-up of an interference pattern of single electrons. The numbers of electrons are 11 (a), 200 (b), 6,000 (c), 40,000 (d), and 140,000 (e).] This is despite the fact that photons can and do arrive at the very same spot if only one slit is open. In other words, if the left slit is open and the rights slit is closed, or if the right slit is open and the left slit is closed, the photon can reach the point where destructive interference takes place. But if both slits are open, not a single photon will get to that same spot. How can a single photon destructively interfere with itself? How would a photon, about to pass through the right slit, know whether or not the left slit was closed? The truth is hard to explain, but in reality the photon is not passing through either slit. It is instead going through both paths at the same time, destructively interfering with itself. The double-slit experiment is remarkable in that it clearly expresses the puzzling nature of the quantum world. The great physicist Richard Feynman said that all of quantum mechanics can be gleaned from carefully thinking through the implications of this single experiment: "One would normally think that opening a second hole would always increase the amount of light reaching the detector, but that's not what actually happens. And so saying that light goes either one way or the other is false. I still catch myself saying, Well, it goes either this way or that way, but when I say that, I have to keep in mind that I mean in the sense of adding amplitudes: the photon has an amplitude to go one way, and an amplitude to go the other way." I told you photons are weird!